Nice guy card! Great image/sentiment. Very nice card. I have never purchased any digital images, but I'm going to check them out right now. You sure have me curious. Great card Christina! I love that paper pad! I love the simplicity and clean design of this card. TFS. 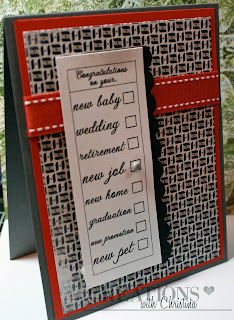 Love the card and the ease it would take to make. Will have to make a few of these. Thank you so much. Great work. So Christina, I've seen you mention digi stamps before. Can you explain, do you just print them on your paper/cardstock at home? This is really a cute card.. Simple and sweet!! TFS!! Love the masculine colors. Strong, but not boring. Loved it....really great card for a man or a woman. Great card and love the idea of a male card great colors. Thanks for sharing. This card is PERFECT!!! Great Job!! perfect male card with the checklist of accasions, no fussy business!